In this thrilling story full of adventure and romance, Sleeping Beauty is more than just a lonely princess waiting for her prince—she's a brave, tenacious girl who never backs down from a challenge. With vampire-slaying talents that she practices in secret, Sleeping Beauty puts her courage to the test in the dark of night, fighting evil as she searches for a way to break the spell that has cut her off from her family. 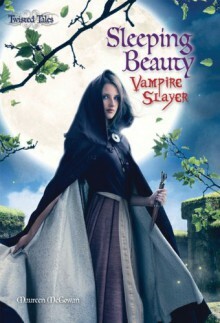 In a special twist, readers have the opportunity to make key decisions for Sleeping Beauty and decide where she goes next—but no matter the choice; the result is a story unlike any fairy tale you've ever read!Sleeping Beauty: Vampire Slayer is an entirely new type of fairy taleone that will keep today's kids guessing and offer them hours of magical fun.